The Woodbury Friends Meeting House was built in 1715 and expanded in 1785. As a nonconformist Christian denomination, Quaker religious practices dictate that worship should not take place in a special place. Accordingly, Quaker meetinghouses were built in traditional style, purposely lacking any of the typical structural design or appointments of a church. During the founding of Woodbury, the Friends Meeting House served as a community center as well as a meeting place for religious activities. During the American Revolutionary War, the Friends Meeting House was occupied by American militiamen and Hessian soldiers. Following the Battle of Red Bank along the Delaware River in 1777, the meetinghouse was used as a hospital for wounded Hessian soldiers. 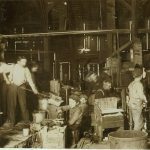 Glass production was a major industry in Woodbury at the dawn of the twentieth century. 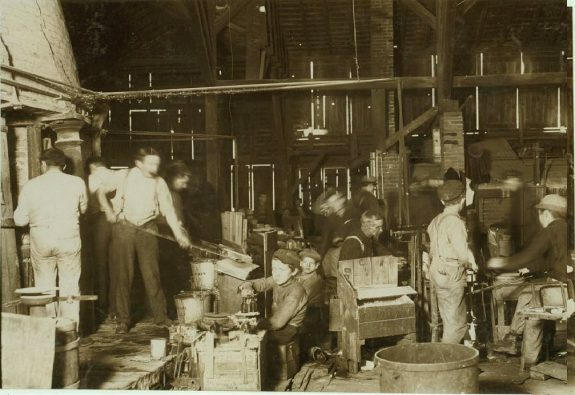 At the Woodbury Bottle Works, young men and boys worked in harsh conditions. This scene was photographed in November 1909 by Lewis Wickes Hine (1874-1940), who, working as an investigative photographer for the National Child Labor Committee, documented working and living conditions of children in the United States between 1908 and 1924. 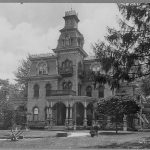 During the nineteenth and early twentieth centuries, Woodbury was also home to many other industries, including those employing blacksmiths, wheelwrights, machine toolers, and carpenters. O.H. 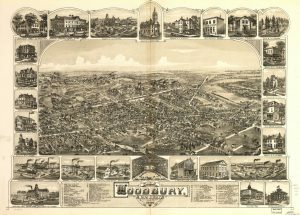 Bailey & Co. published a detailed artistic survey of the city of Woodbury as it appeared in 1886. The illustration conveys an impression of the city as dynamic and growing, with smokestacks, railroads, barges, and stockyards dotting the landscape. Featured along the border are landmarks, including industrial sites like the Woodbury Glassworks, amusements like the Woodbury Roller Rink, and commercial areas like the G.G. Greens Laboratory. The artistic rendering also features the Woodbury Creek, a vital waterway linking the factories of South Jersey with the rest of the Delaware Valley. 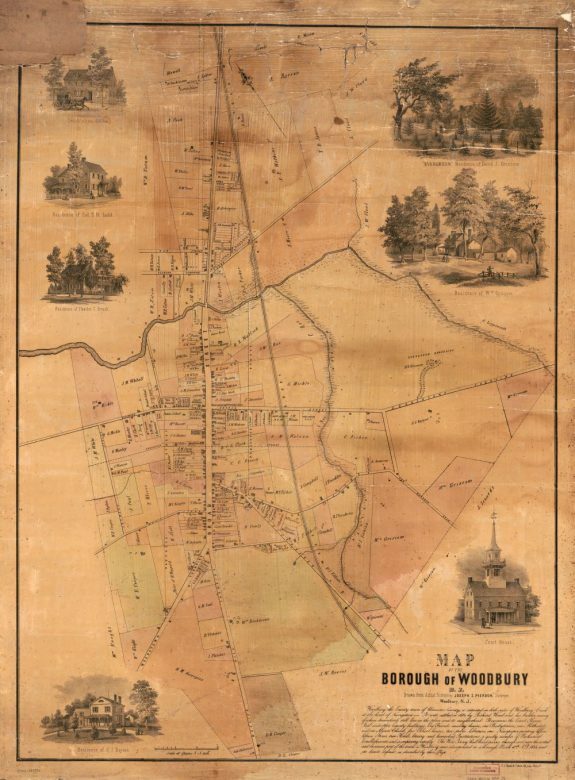 This real estate map, drawn by Joseph Z. Pierson in 1854, depicts the city of Woodbury as it appeared in the mid-nineteenth century. Featured with artist renderings are the homes of prominent residents, including Colonel S.H. Ladd, Charles C. French, and David and William Griscom. The “Constitution Office” and the courthouse are also illustrated. 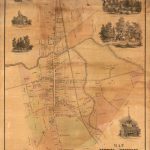 The map also includes a brief history of the town as well as a list of civic institutions such as churches, schools, libraries, and county offices. 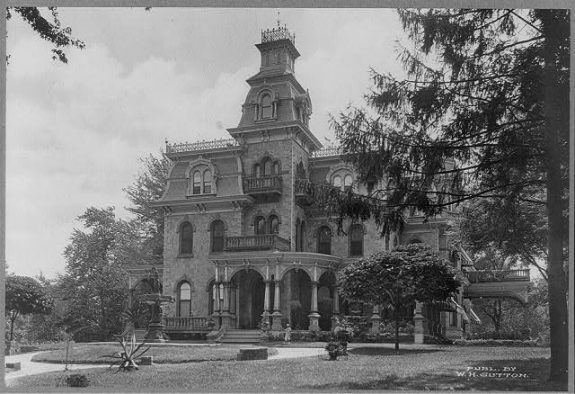 Businessman George G. Green (1842-1925), who lived in this gray-green stone mansion known as Gray Towers, was influential in the development of Woodbury during the late 1800s. His businesses, including the Standard Window Glass Works, the Green Steam Planing Mill, and the G.G. Green commercial building, promoted the city’s growth and brought many jobs to the area. Gray Towers remained a landmark well into the twentieth century, but it eventually fell into disrepair and was destroyed by fire in May 1968. 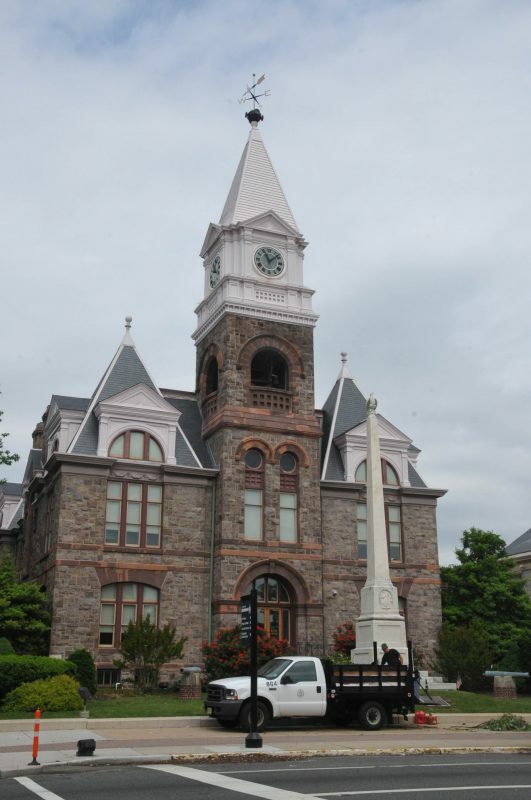 The Gloucester County Courthouse, built to replace the original 1787 courthouse, opened on April 5, 1887, and in the twenty-first century remained the tallest structure in the city. In addition to serving as the city centerpiece, the courthouse became the center of the Gloucester County Justice Complex in 1985. The courthouse has also served as the county seat, chosen over Camden by the New Jersey State Legislature in 1825. 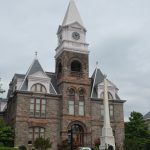 Having gone through several restorations throughout the twentieth century, the courthouse remains one of the most recognizable structures in Gloucester County. 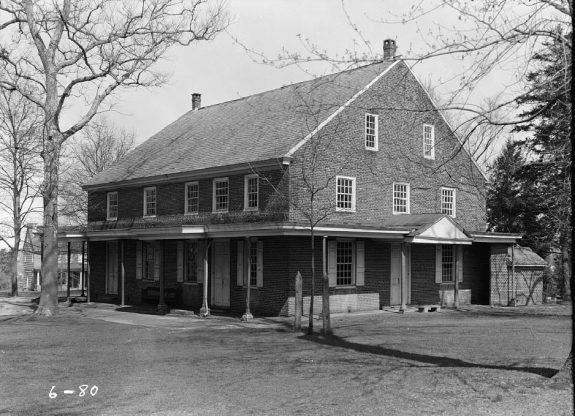 Located on the Woodbury Creek in the northwestern part of Gloucester County, Woodbury formed as a result of the first Quaker family to settle the area, in 1683. Initially a lightly populated farming community, the village eventually became the seat of Gloucester County and over time emerged as an important center for transportation, manufacturing, and for the legal and medical professions. Woodbury remained a farming hamlet throughout the colonial era. Initially a part of Deptford Township, Woodbury was known as a village until its designation as a borough in 1854. The availability of quality farmland in the surrounding area provided a major attraction for settlement. A Quaker community from the beginning, in 1715 the village constructed its Friends meetinghouse, which served as a center for the community during the period. Established in 1686, Gloucester County designated Gloucester Town (later Gloucester City) as its county seat. Due to its location on a virtual island, the town’s growth lagged, and when the County Courthouse, built in 1719, burned down in 1786, county officials sought a new location to conduct governmental business. Woodbury, with its rich agricultural hinterland, won that honor by referendum. Woodbury’s designation as county seat, capped by construction of a new county courthouse in 1787, spurred the town’s growth. By 1815, the village contained four taverns and over seventy houses, which were filled with a diversifying workforce of farmers, blacksmiths, merchants, lawyers, and physicians. Population growth remained modest, however, even after the completion of the Woodbury and Camden Railroad in February 1838. Due to a lack of passenger traffic and the national financial panic of 1837, the line closed only eight years later. Despite the loss, Woodbury continued to grow. The West Jersey Railroad restored rail service to Woodbury and South Jersey beginning in 1854. George G. Green (1842-1925) brought his patent medicine and glass manufacturing business to Woodbury in the early 1870s. 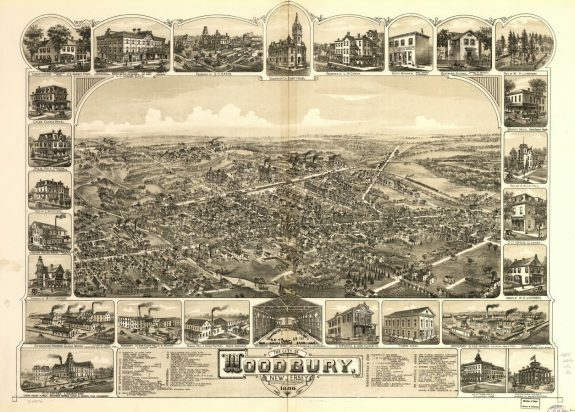 His businesses, and the employment opportunities they offered, further spurred Woodbury’s growth, with the population expanding from 2,100 in 1870 to 3,867 by 1890. 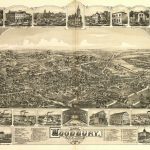 Legislatively designated as a city in 1871, Woodbury’s new status spurred even more employment opportunities. The United States’ entry into World War I in 1917 further boosted Woodbury’s manufacturing industries. The building that had housed the Blasius Piano Company was repurposed to manufacture gun stocks and to store munitions for the U.S. Army. After the war, the Belber Trunk Company moved into the Blasius building after Blasius entered bankruptcy in 1919. The Belber Trunk Company remained in Woodbury until 1949, when it responded to a union strike by relocating to Altoona, Pennsylvania. Woodbury’s population reached its peak in 1960 at 12,453. The city’s central role in the county nonetheless suffered with the boom in automobile use during the 1950s and 1960s. As a sign of its lost status, passenger rail service through Woodbury ceased in 1971. While the city’s immediate decline was modest, its status continued to decline as the area’s first mall, in Deptford Township, opened in 1975. The new mall, about three miles away, swiftly became the preferred shopping center for people who formerly shopped in Woodbury. In the face of the setbacks the service industry faced in Woodbury, the continued presence of the legal and medical professions prevented the town from entering a spiral of complete decline. The county completed a new courthouse—the Gloucester County Justice Complex—in 1985 in the northeastern part of town and completely revitalized the neighborhood hosting the new building. Lawyers seeking to move their practice to within walking distance of the courthouse bought many Victorian-style houses, which they then renovated into new law offices. Just a few blocks north of the new Justice Complex, Underwood Memorial Hospital continued to expand during the late twentieth century. Established as a private facility in the 1910s, the hospital erected several new buildings in the 1970s and 1980s. Underwood merged with South Jersey Healthcare to form the Inspira Health Network in 2012. Its center in Woodbury became a 305-bed hospital, which employed a staff of over 1,800 full- and part-time workers. This spirit of revitalization and renewal continued when Woodbury in the late 1990s renovated its dated city hall, portions of which had been standing since 1774. A developer purchased Green’s Block, an opera house constructed by the medicine tycoon George Green in 1880, saving it from the wrecking ball in the late 2000s, choosing instead to renovate and repurpose the building for shopping and offices. Just as lawyers had done in the 1980s, some developers began to buy into historic Woodbury. With a total population of 10,174 in 2010, Woodbury exhibited an improving level of vitality as the Gloucester County seat. Arthur Murphy earned his Master’s Degree in Public History from Rutgers University-Camden and will enter Rutgers Law School in Camden in the fall of 2017. Cushing, Thomas and Charles E. Shepard. History of the Counties of Gloucester, Salem, and Cumberland New Jersey with Biographical Sketches of their Prominent Citizens. Philadelphia: Everts & Peck, 1883. Mickle, Isaac. Reminisces of Old Gloucester or Incidents in the History of the Counties of Gloucester, Atlantic and Camden New Jersey. Philadelphia: Townsend Ward, 1845. Stewart, Frank H., editor. 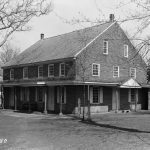 Notes on Old Gloucester County New Jersey: Historical Records Published by The New Jersey Society of Pennsylvania. Camden: Sinnickson Chew & Sons Company, 1917. Sands, Robert W., Barbara L. Turner, and Gloucester County Historical Society (N.J.). Woodbury. Charleston, S.C.: Arcadia, 2006. Carter, Benjamin F., James D. Carpenter, and Frank H. Stewart History of Woodbury, New Jersey, From 1681 to 1936. Woodbury, N.J.: J.D. Carpenter, 1937. Woodbury Collection at the Gloucester County Historical Society, 17 Hunter Street, Woodbury, N.J.
Museum of the Gloucester County Historical Society, 58 N. Broad Street, Woodbury, N.J.
G.G. Green’s Block, 108 S. Broad Street, Woodbury, N.J.
Gloucester County Courthouse, 1 N. Broad Street, Woodbury, N.J.